For most, a smartphone is a very intuitive device that simply requires a touch of the screen to operate. But to those with disabilities of the upper extremities who have difficulty using their hands and fingers, a smartphone is not so easy to manipulate. Samsung Electronics recently announced that it has developed an application called DOWELL that allows users with disabilities of the upper limbs to control their smartphones with existing assistive computer devices. Samsung is planning on launching the service later this year. Currently, those with upper limb disabilities utilize head mouse devices, track balls, and other assistive technologies to interact with computers. In conjunction with these devices, they are able to use computers with the help of software that eliminates the need for button click control. However, as smartphones require various manipulative motions such as tap-clicking, swiping, and pinching to operate, these users generally have difficulty controlling these devices. Yet, despite the fact that smartphones have recently become more widely used, a smartphone assistance program for those with upper limb disabilities has yet to be developed. That is, until now. Once a user installs the DOWELL application and connects his or her smartphone to a USB-type computer assistive device, the user can utilize the upper and lower sections of the smartphone screen as DOWELL’s user interface. Within the upper screen, one can opt to tap or drag, among other touch commands. From the lower screen, the user can access the menu, home screen, back function and other basic hardware keys of the Galaxy smartphone. 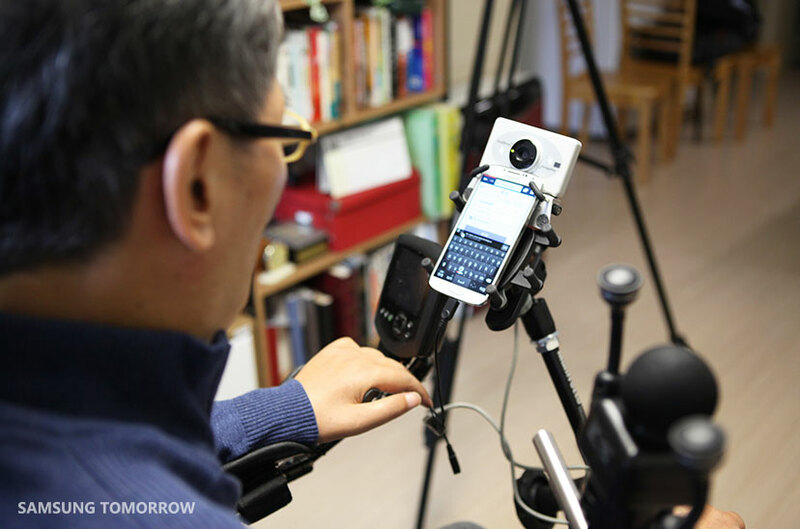 During product testing, it was determined that people with upper limb disabilities can conveniently and efficiently use smartphones by connecting assistance devices that they already own without purchasing additional, expensive equipment. DOWELL was created by Samsung Software Membership, an organization that aims to assist both undergraduate and graduate students in gaining software expertise, along with employees of the Samsung Electronics Software Center. DOWELL is available on most Samsung smartphones (Galaxy S3 to the most recent models) and it will be commercialized in the third quarter of this year.